Two tools that have been updated for 2017 are now available for helping find probiotics with evidence on different clinical conditions. 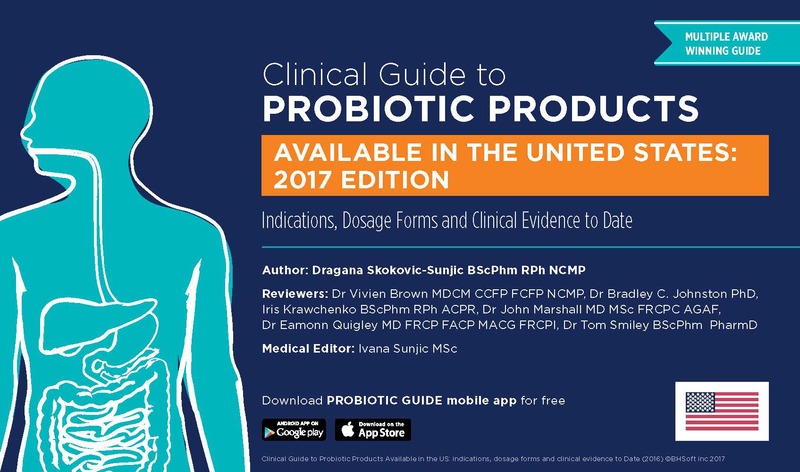 Clinical Guide to Probiotic Products Available in the US: 2017 Edition. I like this guide because the evidence is reviewed and ranked by a reputable, independent group of scientists and clinicians. It is organized around probiotic food and dietary supplement products available in the United States. The recommendations are tied to brand names, making it easier for consumers to find recommended products. Probiotic strain names and doses are also listed. This guide covers a wide range of clinical endpoints, including numerous gastrointestinal conditions (management of constipation symptoms, prevention of antibiotic associated diarrhea, prevention of Clostridium difficile associated diarrhea, travelers’ diarrhea, H. pylori eradication, irritable bowel syndrome symptoms), oral health, vaginal health, prevention of nosocomial infections, reduction of LDL and prevention of common infectious diseases. This guide grades available evidence with a I, II or III grade. Grade I is at least one randomized, controlled trial that shows the benefit. Grades II and III are given to lower quality evidence. There is also a version for the Canadian market as well as an interactive version (Google Play and the App Store). This guide is produced by the Alliance for Education on Probiotics (AEP) and is funded by educational grants from several probiotic companies. 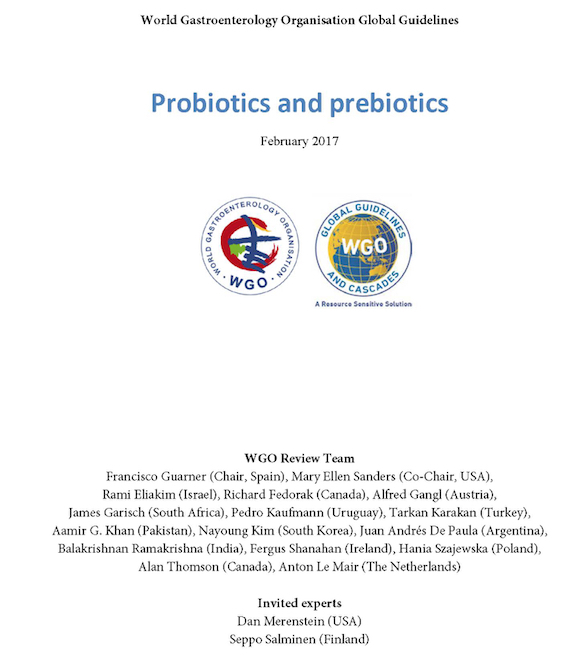 Practice Guideline on Probiotics and Prebiotics is produced under the auspices of Global Guidelines by the World Gastroenterology Organisation (WGO). This guideline is developed by a large group of independent experts in the field and is focused only on gastrointestinal conditions. This guide is organized around specific probiotic strains or strain blends as well as prebiotics and does not mention product names. Consumers and healthcare providers need to find locally available products with the strains indicated. The introduction to this guideline provides useful basic information about probiotics (and prebiotics), culminating in 2 tables (Tables 8, for adult indications, and 9, for pediatric indications), which summarize the gastrointestinal conditions for which there is evidence from at least one well-designed clinical trial. The guide is currently only available in English, but the WGO made the past edition available in French, Portuguese, Mandarin, Russian and Spanish. Either of these guidelines can help you find products that contain researched strains.